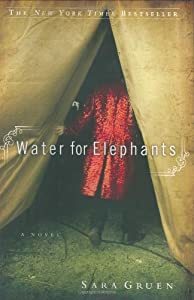 Greg and I went to see “Water for Elephants” the other night – and while it is not my favorite movie of all time, there were some very thought-provoking things in it. For starters – a young man after losing his parents in a tragic car accident, starts to walk away from everything he’s known in search of another life. He chances on a train and jumps on – not just any train – a train of circus performers. And he finds himself caught up in the life of the circus and meets the woman who will ultimately change his life. Now while I believe that we make our own choices in life and there are no coincidences – I also have to believe that things happen the way they do for a reason. I was reading a quote from C.S. Lewis today. In friendship…we think we have chosen our peers. In reality a few years’ difference in the dates of our births, a few more miles between certain houses, the choice of one university instead of another…the accident of a topic being raised or not raised at a first meeting–any of these chances might have kept us apart. But, for a Christian, there are, strictly speaking no chances. A secret master of ceremonies has been at work. Christ, who said to the disciples, Ye have not chosen me, but I have chosen you, I can truly say to every group of Christian friends, Ye have not chosen one another but I have chosen you for one another. The friendship is not a reward for our discriminating and good taste in finding one another out. It is the instrument by which God reveals to each of us the beauties of others. And so if this is true – that people are put in our path to help us through our journey – maybe we should look at adversities in the same way – as a means for helping us on our path – bringing something that we need at that very moment in time. And maybe I should spend less time in wondering, lamenting, searching for the reasons, blaming and feeling ill-used when things don’t go the way I think they should – and when my path isn’t as smooth as I think it should be. Maybe – just maybe – these things and people are God’s wonderful providence – provided for me by His great love. What adversity are you facing today? What difficult people do you have to deal with? Coincidence – or Providence? I pray because I can’t help myself. I pray because I’m helpless. I pray because the need flows out of me all the time – waking and sleeping. It doesn’t change God – it changes me. Prayer. Something happens to me when I pray. I gain perspective that I am very small – and He is very big. I have no control – and He sees the big picture – and all events from beginning to end, all at once. And somehow – there is great comfort in this knowledge. When I know that my problems, stresses and circumstances do not catch Him off guard – that nothing surprises Him about my life – then somehow I feel better and can relax – knowing He is in control. I know for me – I need to hear this because I am weak and fall short. I also tend to compare God’s love for me with other people in my life. Others who have failed me – when I have failed them – or judged me when I have been in the wrong. Even turned away instead of sticking it out. God’s love is not like this. He wants me to come to Him with my concerns and needs. He will not be shocked – or turn away – even judge or talk about me, like others in my life have. He knows everything about me before I even say anything. He knows it – even before I think it. He knows it – even before I do. We are safe with Him. God is constant and will not change. He is always the same. It is me that changes by knowing Him better. It is me that changes by praying. It is me that needs the changing – not Him. Dear Lord – help me to come to you – not to hesitate because I am afraid you will turn me away and say, ‘Straighten up! What’s wrong with you anyway! Have I taught you NOTHING!’ – you would never do this – you are peace, love, joy and mercy. Help me to realize this. Help me to humble myself and invite you to walk along beside me – on my journey. Help me – change my heart as I release the deepest parts to you. I saw this quote today on one of my friend’s facebook page. It is nice to know that I am not alone. That silence is sometimes the answer. That standing strong in faith is not for the “fainthearted” or those that “give up” too easily when hurt and pain come into play. Faith is a funny thing. It is a conviction that no matter what is going on around you – you are unmoved and unswayed by human emotion. Everything can be falling apart around you (and sometimes it is) and yet – you still can stand. I have to say – that no matter what has gone on in my life – circumstances I found myself in the middle of – some by my own choosing – some that were not – I never once questioned my faith. But waiting for God’s will – that’s entirely another subject. I would rather be active and “help” God to find the answer. At least I’m doing SOMETHING, right? I am guilty of being the kind that God finally says, “Okay – have it your way” I usually make a really good attempt at it – do GREAT things – help people – be a “leader” and good “role model” for others. Try to make “right” a very bad or complicated “wrong” – and then just end up making a BIG MESS out of it. The more complicated – the deeper in I go. We are responsible for our own bad choices. Maybe they weren’t necessarily bad choices to begin with – but somewhere down the path they became that way. We told too much – we received too much – we revealed what should not have been – we blindly accepted things because of pride and because it made us feel good – we trusted the wrong person – and the list goes on and on. I cannot blame the devil. I cannot blame God. I did it. Me. Myself. No one else. I can’t blame my brother. I can’t blame my sister. I can’t blame my childhood or other events in my life. I can only hold myself responsible. When God allows me to “do my own thing” for a season – it is because of His great love for me. He not only loves me – He actually likes me. Is He aware that I’m going to completely MESS IT UP? Oh yes. Does He let me do it anyway? Yes. And what I find waiting for me at the end of my insistence to “have it my way” – is brokenness and heartache. Living outside the “walls” of His protection and proper boundaries reeks havoc on the heart and emotions. And from one who really knows what she speaks of – take it from me: It is NOT worth it. Finding God’s Will for my life may be just as simple as continuing to live close to His side – hearing His voice in every area of my life and heart. Being sensitive to the “dangers” all around me – and my own personal weaknesses. Allowing Him to whisper to me – and breathe His purpose and direction into my daily activities. Letting go of the things from the past that are heavy for me. Keeping my life simple and directed. Allowing His mind and thoughts to permeate through me as I do my work – as I relax at home – as I speak with others who are struggling – as I teach my precious students – as I encourage and build up my husband – as I interact with my son. All of these things are normal – everyday things I do. And I find fulfillment – from the simple ordinary tasks. Maybe that’s the secret. Maybe the simple – is God’s will.